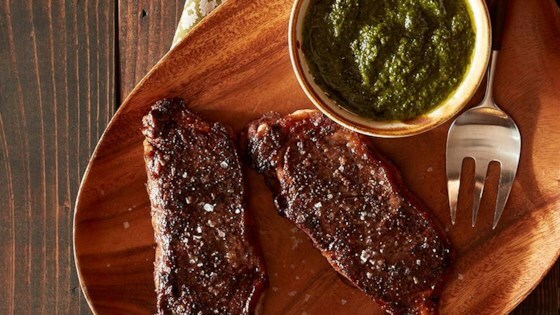 "Spice up your next meal with this tempting Roasted New York Strip Steak with Chimichurri Sauce that is sure to be a family favorite." Mix together 3 tablespoons olive oil, cumin, red pepper flakes, oregano and salt to taste in a bowl and coat the steaks in the mixture. Heat a large frying pan on high heat and fry the steaks on each side for 2 to 3 minutes until they are browned. Place two 1 1/2 to 2 feet long sheets of Reynolds Wrap(R) Aluminum Foil on a table and place each steak in the center of the foil and fold up the ends and the outside of the foil to create a packet. Bake the steak for 10 minutes for a medium-rare internal temperature. Add 5 more minutes of baking to achieve a medium internal temperature. Remove the steaks from the packets and let them rest for 2 to 3 minutes before serving. Combine the garlic, parsley, cilantro, red wine vinegar, remaining 2 tablespoons of olive oil and salt and pepper in a food processor and process on high speed until it becomes like a paste. Serve the steak alongside the Chimichurri Sauce. See how to roast a moist, tender turkey the mess-free way. Make a Reynolds Wrap® Aluminum Foil packet for delicious tasting food and easy cleanup. I made it exactly as instructed. Steak came out wonderful! (I skipped making the sauce and added garlic to the steak) Will make again and again! Thank you. I love this recipe! I make it according to the directions and it is so yummy. I especially love the sauce. Amazing! Everyone loved it. My mom was visiting and she is from New York lol loving steaks and she love this one! The cooking time was way off. I cut my roasting time back to 8 minutes and it still came out medium well. The sauce was fantastic though.